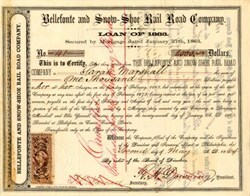 Beautifully engraved certificate from the Bellefonte and Snow-Shoe Rail Road Company issued in 1864. This historic document was printed by Alexander, Printer and has an ornate border around it. This item is hand signed by the Company's President(Richard H. Downing) and Secretary (F.C. Yarnall) and is over 140 years old. Centre County's first railroad, the Bellefonte and Snow Shoe, was the idea of a group of Bellefonte businessmen, which included Andrew Curtin (elected Pennsylvania Governor in 1860), Hugh McAllister (a prominent attorney and banker), and James Irvin (ironmaster and former Congressman). With the backing of Philadelphia investors (nearly all of whom were Quakers, or Friends ) , they acquired thousands of coal-rich acres on the mountaintop near Snow Shoe. The line extends from Bellefonte to Snow Shoe, a distance of twenty six miles, where the company owned fifty six thousand acres of valuable timber and coal lands, purchased of J. Gratz, of Philadelphia. Hampered by the problem of transporting lumber and coal to Bellefonte and the Pennsylvania Canal, they engaged William Harris to design a railroad for the 1,000 foot drop from the mountaintop area to an outlet in Bald Eagle Valley. He came up with a right-of-way for the Bellefonte-Snow Shoe Railroad Co. and the famous "switchback" system down the mountain. The officers of the road in '77 were: Richard H. Downing, President; Wistar Morris, Jacob P. Jones, William Helme, of Philadelphia, and Robert Valentine, of Bellefonte, Directors; General Superintendent and Treasurer, Daniel Rhoads, of Bellefonte; Chief Engineer, James L. Sommerville, also of Bellefonte. History from the city of Bellefonte.